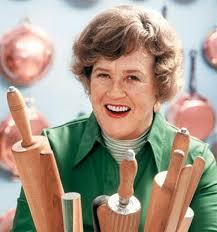 Heroes, Heroines, and History: Julia Child - TV chef, cookbook author and spy? 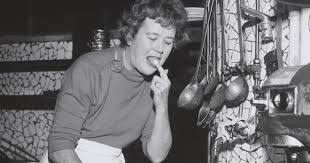 Julia Child - TV chef, cookbook author and spy? What do you know about Julia Child? Did you ever watch any of her cooking shows? Maybe you watched the movie “Julia & Julia” like I did. I have to admit I didn’t follow her shows and knew little about her. But recently, while researching women spies in World War II, I came across her name and wanted to learn more. Julia McWilliams was born in 1912, the oldest of three children. Her family was wealthy and had a cook who prepared their meals, so Julia didn’t learn how to cook until much later. Julia attended boarding school, then graduated from Smith College with a history degree. She played tennis, golf and basketball while attending school. When the United States entered World War II, Julia, like most other Americans, wanted to do her patriotic duty. But at 6’2,” she was too tall to join the Women’s Army Corp (WACS) or the Navy’s counterpart, the WAVES. Those rejections led her to join the Office of Strategic Services (OSS), the forerunner of the CIA in Washington, DC. Child worked as a research assistant in the Secret Intelligence Division, reporting directly to the head of OSS, General William J. Donovan. She was then transferred to China where she served as the chief of the OSS Registry. 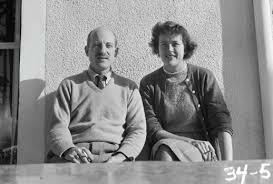 It was in China where Julia met Paul Child, an OSS officer, whom she eventually married. When the couple moved to Paris, Julia was exposed to fine French cuisine, and in an effort to learn to cook for her husband’s gourmet taste, Julia took lessons at Le Cordon Bleu. Her first cookbook, Mastering the Art of French Cooking, was published in 1961 after nine years of research, rewrites and rejections, something many writers can identify with. Julia Child is credited with many firsts - bringing French food to American cuisine, being the first woman to host her own television cooking show, and being the first woman inducted into the Culinary Institute of America Hall of Fame. Julia’s kitchen which her husband designed with custom-built high counters in their Massachusetts home is now in the Smithsonian’s Natural Museum of American History. What foods do you think Julia introduced to America? I'm not sure what foods Julia introduced to America, but her life story was so interesting. I loved Julie and Julia, and then read her own autobiography. The love story between her and her husband was a tale in itself. Thanks for the post! I enjoyed the movie Julie and Julia and knew a bit of her history. Her French cook book sounds interesting. Not sure which foods she may have introduce to America, but I do know that getting one of her cookbooks as a shower or wedding gift was wonderful. We had a copy in our Home Ec. classroom when I taught it. Fascinating post about a remarkable woman. 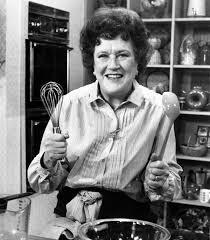 Some of the foods Julia Child introduced to the US were omelettes, quiche, coq au vin, French onion soup, Beef Bourguignon. 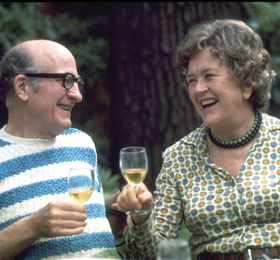 Informative and great post about Julia Child. I'm not one to watch cooking shows. Thanks for sharing some of the foods she introduced to the USA. Blessings.